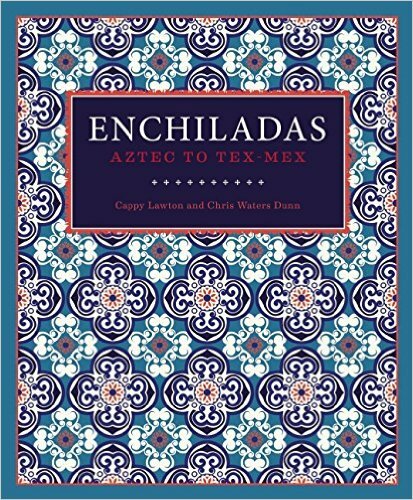 I recently received a review copy of the fantastic new cookbook Enchiladas: Aztec to Tex-Mex by authors Cappy Lawton and Chris Waters Dunn. 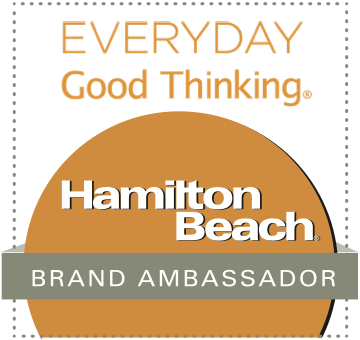 Lawton is a popular San Antonio restaurateur, and Dunn is a cooking teacher and culinary consultant. This amazing cookbook features more than 60 different enchilada recipes -- both traditional and modern varieties. 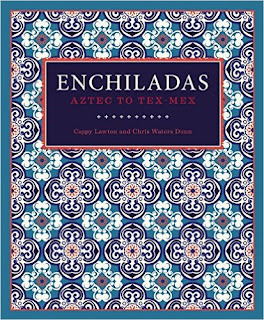 If you think enchiladas are strictly a Tex-Mex creation, this cookbook will show you otherwise! The cookbook features chapters for chicken, pork, beef, seafood, and dairy fillings...and it teaches you how to make your own enchilada sauces, toppings, and other accompaniments. If you're intimidated by the thought of making homemade enchilada sauce, don't be! Each recipe walks your through the process step by step, and the end result is so much more flavorful than pre-made canned sauce. I had a hard time deciding on one recipe to feature from this book, but ultimately opted to make Chicken Enchiladas Rojas. From start to finish, it took less than an hour to make a batch of delicious homemade chicken enchiladas -- including making the spicy chile sauce from scratch. Two big time savers that I utilized were to use a roasted deli chicken for the filling, and I purchased fresh corn tortillas. 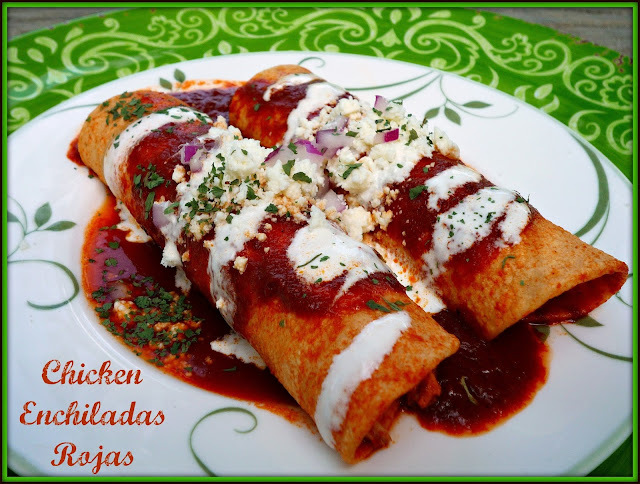 These flavorful enchiladas are not the least bit heavy, and they can be assembled on a serving platter or on each person's individual plate. They're garnished with crumbly Mexican queso fresco, diced purple onion, a drizzle of Mexican crema. I'll show you step by step how to cook and assemble these colorful, flavorful enchiladas! Step 1: Start with the sauce. Dry roast the dried chiles in a large non-stick skillet over med-high heat until toasted and fragrant. 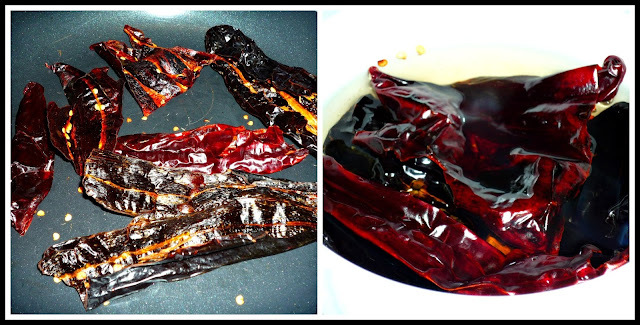 Then, soak the chiles in warm water until softened -- no more than 15 minutes. While the chiles soak, prepare the rest of the enchilada sauce ingredients. Step 2: Place the tomatoes, onion, and garlic cloves on an unoiled comal or non-stick pan over med-high heat. Dry roast, turning every few minutes, until they are softened and have black spots. Core the tomatoes and remove the peels from the onion and garlic cloves. Drain the chiles from the soaking water. 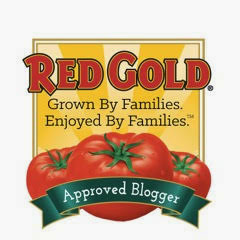 Place the chiles, tomatoes, onion, garlic, and marjoram in a blender. Process to a smooth puree, adding 1 cup of chicken broth to make a sauce. Add the vegetable oil to a large non-stick saucepan. Strain the sauce through a fine mesh strainer into a large non-stick saucepan. Step 3: Add up to 1 cup additional chicken broth to make a light sauce. Bring to a boil, reduce heat to simmer, and cook the sauce for about 10 minutes. Add salt to taste. Place the shredded chicken breast in a bowl and add 1/2 cup of the enchilada sauce. Stir to combine. 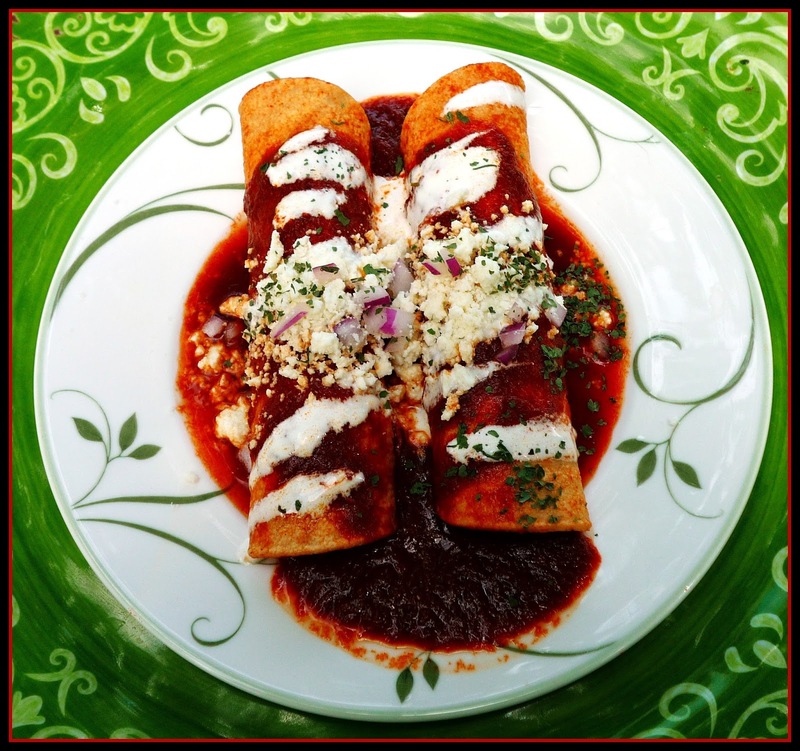 To assemble the enchiladas, dip a softened corn tortilla into the enchilada sauce to coat both sides. Place 2 tbs. of the chicken mixture on the bottom of the tortilla. 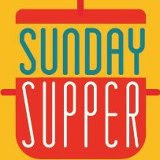 Roll up and place 2-3 enchiladas on each plate. Step 4: Pour a bit of more of the enchilada sauce on top of each serving of enchiladas. 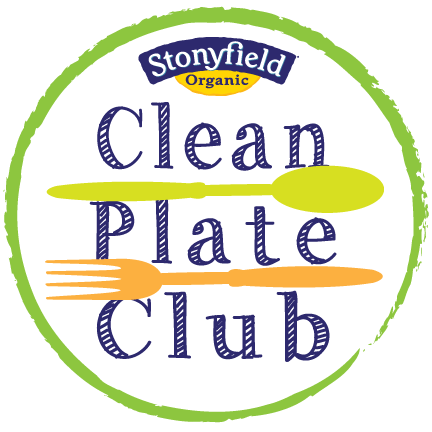 Garnish the enchiladas with a generous amount of crumbled queso fresco (a Mexican cheese similar to feta), some finely diced purple onion, and cilantro. Finally, drizzle with the crema Mexicana and serve immediately. These enchiladas are bursting with flavor. The enchilada sauce is mildly spicy, with a fresh tomato-based flavor. The tangy crema and mild queso fresco provide a nice counterbalance to the spiciness of the sauce, and the purple onion provides a nice bite in the background. 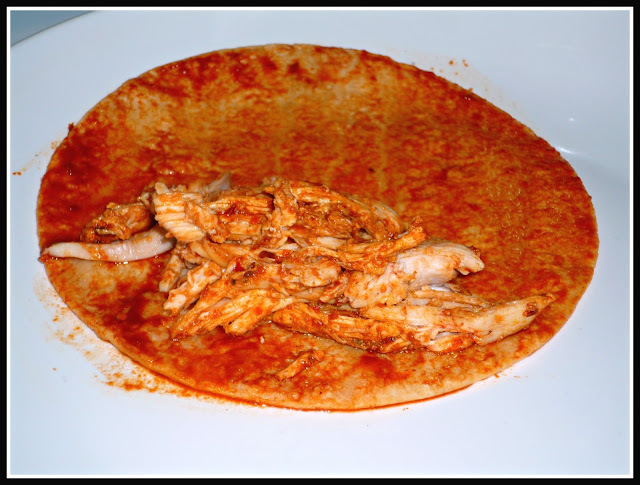 The chicken is flavorful and juicy, and the corn tortillas provide a perfect amount of earthiness. Add it all up, and you have a perfect entree for next week's Cinco de Mayo celebrations! Spanish rice and borracho beans make perfect side dishes to round out your dinner menu. 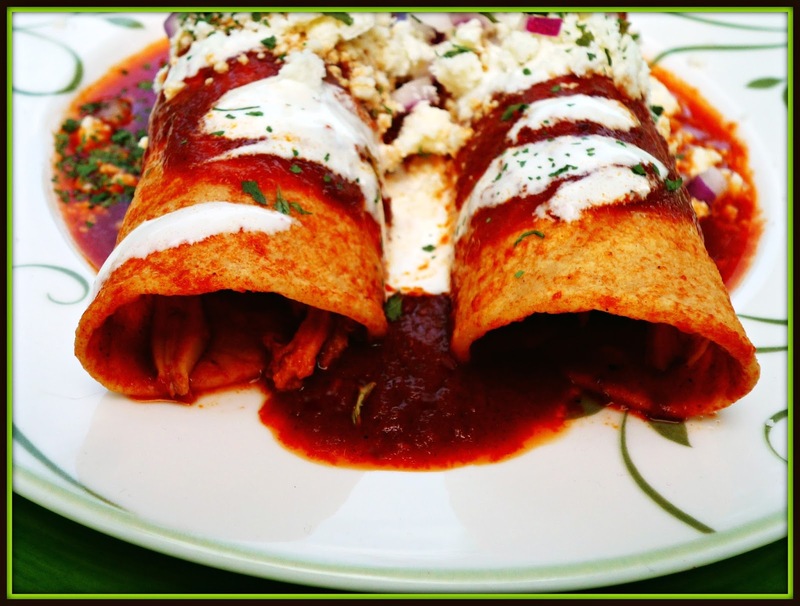 Enchiladas: Aztec to Tex-Mex recently won the 2016 Best Latin American Cuisine Book in the USA by the Gourmand World Cookbook Awards. I just love this book and think that it's a perfect addition for any cookbook collector who loves cooking big-flavor recipes like I do! It's published by Trinity University Press and is available in both hardback and eBook formats. It can be purchased from Amazon, as well as at most major book retailers nationwide. Disclosure: I received an autographed copy of Enchiladas: Aztec to Tex-Mex to facilitate this post. All opinions expressed are solely my own.